There’s a great article today by Gail Collins in the NY Times (My State’s Prettier Than Yours) in which she tries to understand the promotional slogans of our 50 states. Give up Gail. It’s incomprehensible. State and country slogans have always been a pet peeve of mine because they usually don’t relate to anything distinct or different about the state. Collins gives plenty of examples. They’re usually a result of the excesses of bad advertising agencies or over zealous economic development and tourism teams. There’s a list of state slogans at Wikipedia (List of U.S. state slogans) and 105 country tourism slogans at a blog called Tourist vs. Traveller (105 tourism slogans from around the world) along with a nice little video to show them all with their logos (which a lot of tourism development folks think is a brand, but that’s another topic entirely). Collins covers the states pretty well so I’ll focus on some of my favorite country slogans. Did you know Albania is “A new Mediterranean love”? And all this time, I thought it was a mysterious country that supplies pizza parlor chefs to New York restaurants. Austria is “Arrive and revive”. I’m sorry. I don’t know what that means, particularly since I’ll have jet lag for a day or two once I arrive. Here’s one I like: Belarus is “Hospitality beyond borders.” Does that mean I have to leave the country for hospitality? One of my favorites is Romania because I’ve been there twice: “Explore the Carpathian garden.” Now, I never saw the Carpathians on either of my trips (hint: it’s a mountain range), but I suspect that slogan will mean a lot to the winner of any national geography bee. You have to read the list yourself. It’s full of surprises. (Actually, I think that’s Connecticut’s slogan.) You can travel from Pure Russia to 100% Pure New Zealand in a few lines. (Maybe Russia only got to 90% so they didn’t want to tell us how pure they are.) “Bolivia awaits you”, which is nice to know since I probably won’t make it there for a few years. The “Dominican Republic has it all” so don’t confuse that with “Honduras, todo esta aqui.” They have it all too but only in Spanish. I also like “Paraguay, You have to feel it!”. I’ve been there too and I suppose they’re talking about their vicious mosquitoes. Τhe amazing thing about all of these slogans for states and countries (cities have them too; don’t get me started) is that they say absolutely nothing about the country, its culture and what makes it distinct and different. Years ago, states had mottos or nicknames that said something about them and often appeared on auto license plates. Alabama was “The Cotton State”, Florida was “The Everglade State”; Georgia – “The Peach State”; Hawaii – “The Aloha State”; Michigan – “Winter Water Wonderland” and so on. Washington D.C. was “Nation’s Capital”, which tells me a lot and that no other state can say. Now, it’s become “The American Experience”, which is ironic since it’s never been a place that Sarah Palin went looking for her “real Americans”. As a child, I always loved the slogans on license plates and could recite a lot of them. They told me something different about each state and I wanted to visit them all. Now they all blend into a meaningless hodgepodge that I bet nobody but each state’s tourism employees can recite. It’s bad for the state or country, self-aggrandizing and simply poor communication. I used to live in Maine and often drive there for long weekends. We have a house there and a car with Maine plates that says “Vacationland”. 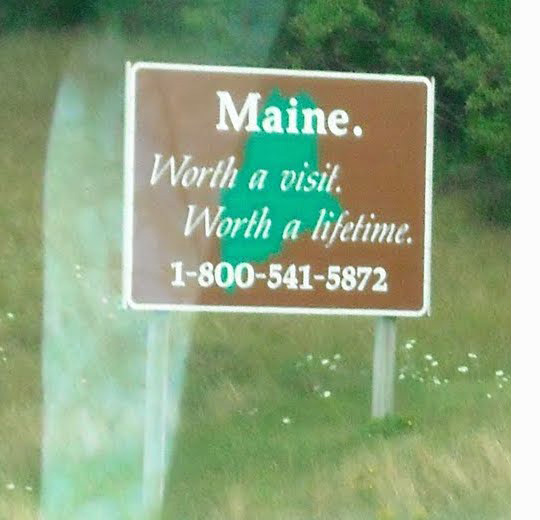 I like that, although I also like that it’s been called “The Pine Tree State.” Sure, there are pine trees in other states but drive into Maine and you’ll think there must be more of them there than anyplace else and it does give you a picture. For many years, they had a slogan on a sign when you enter the state, “The way life should be.” Yes, it’s another one of those silly slogans but I have to admit that as someone who lived there for 25 years, seeing that sign always made me feel like I was home. It meant a way of life to me and I hoped for others visiting for the first time. A few years ago, they added another sign about a 100 feet further down the road that read, “Worth a visit, worth a lifetime”, which signaled to me that they hired a new ad agency that wanted to establish its own brand of creativity. 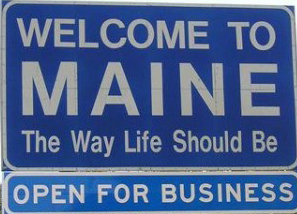 Then, a year or so ago, they plastered “Open for business” underneath “The way life should be.” I suppose it’s nice that the state is trying but did anyone check to see that Forbes put Maine last in its best for business rankings? At its core, this is all about determining what a state or country’s marketing strategy is because slogans, if they have any purpose at all, should tell us why that place is worth our patronage for business, tourism or simply, aspirations. Anyone who pays attention to strategy knows that it must tell us why the product is both distinct and different from any other, and if that strategy is not true to what’s being delivered, it is totally meaningless. Slogans, however, have become a tactic conjured up by advertising or public relations agencies without a thought to strategy and that’s why they are incomprehensible and instantly forgettable. Tags: 50 States, Advertising, Alabama, Albania, Austria, Belarus, Bolivia, Carpathians, Communication, Connecticut, Corporate Myopia, Creativity, Dominican Republic, Economic Development, Florida, Gail Collins, Governments, Hawaii, lidija, lidijastag, Maine, Marketing, Michigan, New York, New York Times, New Zealand, Paraguay, Positioning, Romania, Russia, Sarah Palin, Slogans, Strategy, Tourism Promotion, Washington D.C. I spent last week in Romania, not exactly where most people I know travel, but it was a business trip. It hadn’t been on my list of places to go but I’m glad I went for a couple of reasons. First, it’s different and different is good. We need to see places and meet people who are unlike us, who have a different view and see the world from a different angle of the world. In the U.S. we tend to be too internally focused and while we make a pretty big impression on earth, it’s good for us to see that the planets don’t revolve around the good old US of A. I know that’s anathema to some, but more about that in a later post. Now, why is meeting Rich important to a blog called Corporate Myopia? Well, Rich, who remembered me right away, is the inventor/creator of Decision MAPping® (http://www.decisionmapping.com/) and when I met him fifteen or more years ago, I had the good fortune to be trained in Decision MAPping® by Rich. I can say that it has influenced me ever since and it’s principles are pretty much part of my way of thinking about the world and how we work with clients. You could say that Decision MAPping® teaches you to see the forest for the trees. It is a myopia prevention machine. We wander through our daily lives passing all kinds of signs that tell us what’s important to our co-workers, friends and family and to our clients and customers, and we often don’t see them. They are signs that tell us what’s important to them in making their decisions about us, and all of our clients, customers and constituencies make important decisions that affect us everyday. They decide whether to listen to our sales pitches, sign and renew contracts, monitor our progress and evaluate whether to continue to work with us. It’s not about showing them all the great features we offer but about what concerns them and what keeps them awake at night. Decision MAPping® teaches you to turn the telescope around and learn how they see you. It also teaches you that there are two components in every decision that they make about us. They look at both the content or tangible benefits of what a relationship offers and at the process or nature of our relationship. Like every good marriage, how we engage with each other and manage our processes with others determines whether the relationship will last, but remember it’s they, not us who make that determination. The decisions that others are going to make about us can be put on a map. The map tells us where we are, where we’re headed and how best to get there. For those who learn this process from Rich, it is a sure course to winning and has been used by successful companies and countries for years. You should check it out. At futureshift, we’ve taken the general principles of Decision MAPping® and added our DirectLink® system that enables us to learn what is keeping thousands of people awake at night. Our strategic planning process asks both what your internal capabilities are and matches them with what your target market says it’s looking for. It provides you with insights that either could not be obtained or were just cost prohibitive to do so. We don’t put decisions on a map. You need to see Rich for that but we give you an understanding of what your customers’ and non-customers’ frustrations are. A frustration is simply an unmet need. Meet the need and you’ll have a loyal customer. That flight to Bucharest and seeing Rich was a good reminder to me of what’s important in our business — meeting the needs and solving the business problems of others. Rich and I have begun to exchange ideas and maybe we’ll solve some problems for each other without having to wait another fifteen years for a mutual flight to some far-flung place.